This topic explains how your company is billed for managing devices using the ALMS service, as well as the tools we provide to help you can manage your ALMS usage. 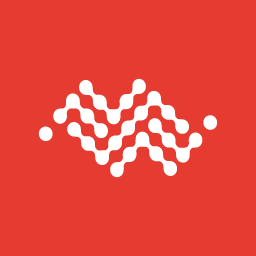 The AirLink Management Service powered by AirVantage uses a pre-paid token model for billing. A token represents one month of management for one device. Tokens are sold in Service Packs. A Service Pack is a set of 12 tokens and provides one year of ALMS management for one device. In other words, by purchasing one Service Pack for each AirLink device in your fleet, the ALMS service will cover them all for one year. You are not required to buy a year’s supply of Service Packs in advance. However we recommend that you buy an adequate reserve to avoid the inconvenience of account suspensions. For instance, if you have 100 managed devices and purchase 50 Service Packs, this provides you with 6 months of prepaid service. If you are planning new and additional device deployments, make sure that you buy adequate Service Packs to cover the new devices. To purchase ALMS Service Packs, please contact your Sierra Wireless reseller. The AirLink Management Service is usage based, you only pay for what you consume. The number of tokens deducted from your stock at the end of the month is the peak number of systems managed during that month. The peak is the highest number of systems managed at any one time, rather than the full list of systems which were “Ready” or “Deployed” at any time during the billing period. You have 20 Deployed systems in your fleet for the entire month: 20 tokens are deducted from your token stock. You have 20 systems in your fleet, but during the month a maximum of 10 were Ready/Deployed at any one time (and these could change during the month): 10 tokens are deducted. 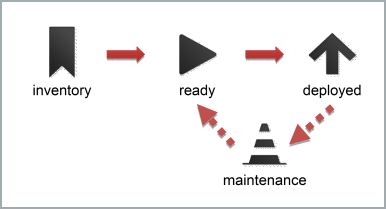 This billing distinction between systems has been introduced to simplify the system deactivation/activation process. In some cases it may save you money and/or administration effort. 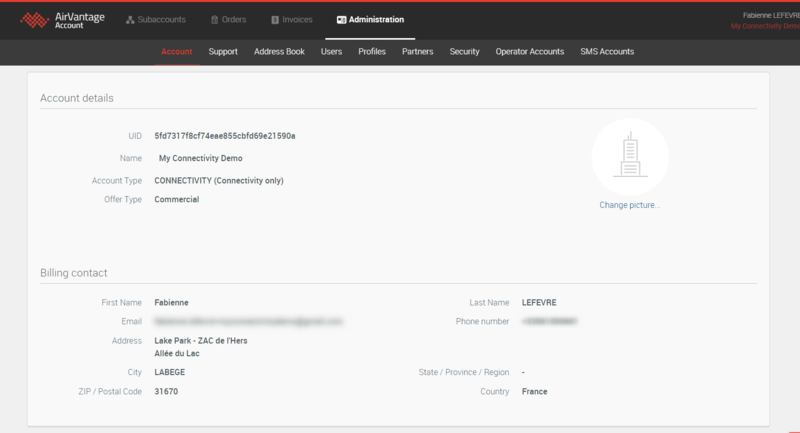 For instance, if you want to remove an AirLink gateway from operation (e.g. for maintenance purpose, or if you simply do not want it to incur unnecessary charges), you can simply change its status to “Maintenance”, rather than needing to delete it from the system and then to add it back later. See here for more details on switching to maintenance. ALMS Enterprise accounts are available to customers with large deployments (up to 10,000 devices). Enterprise customers are billed at an annual flat rate, and do not require or consume tokens, as standard accounts do. The My Token Stock summary page shown below does not appear for Enterprise customers. As an Enterprise customer, you will receive an email notification three months (90 days) prior to your account expiration date so that you can renew your account for another year. Please contact your Sierra Wireless reseller for more information about the ALMS Enterprise option. Account Management functionality brings full visibility on your account including token consumption and remaining token stock so that you can actively manage it. You can login using the same credentials as those you use for AirLink Management Service. Please note that you will only be able to access the Account Management web application if you are an Admin user of your company account. This tab lets you monitor token consumption for your company account. 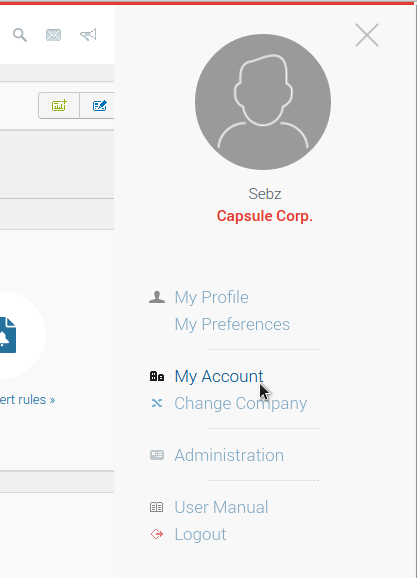 This is the default tab that is displayed when you login to the Account Management app. This is a summary account statement, with details of your company’s token stock and consumption. The graph show token stock use and purchases over the last past 12 months. The section on the right shows the evolution of your token stock for the current month, and how it is predicted to evolve based on the number of activated systems. The number of activated systems shown is the peak number of systems activated within your company account for current month. It is updated once per day. This is the number that will be taken into account to decrement the token stock at end of the month. Your token purchases from Sierra are also considered when calculating the expected token stock. Please note in particular here the estimated date by which you will need to buy more Service Packs. This is projection of when your stock will be fully consumed (with future usage is predicted based on the previous month’s peak). If you are on the ALMS Free Tier, the description will indicate that your account is not consuming tokens and that you will only need to order tokens once you have more than 15 devices in your account. The table presents all the processed orders that you have passed to your Reseller over the past 12 months. Each time you send a purchase order to your Reseller a new line appears in the table as soon as the PO has been processed. 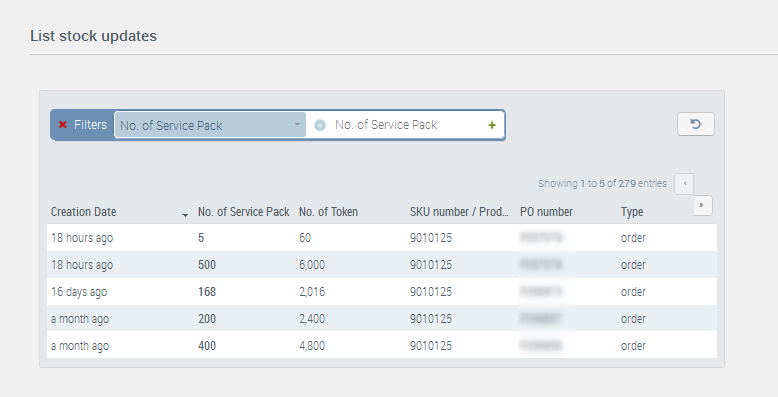 At the same time you will be allocated the number of tokens corresponding to the number of Service Packs ordered. This lets you track your fulfilled orders, with the ability to filter on order date, PO number, number of Service Packs purchased, or product reference. This table also shows stock adjustments. A stock adjustment is done without any link to a new purchase order, in case for example of a credit/debit note. Your stock is then updated accordingly. 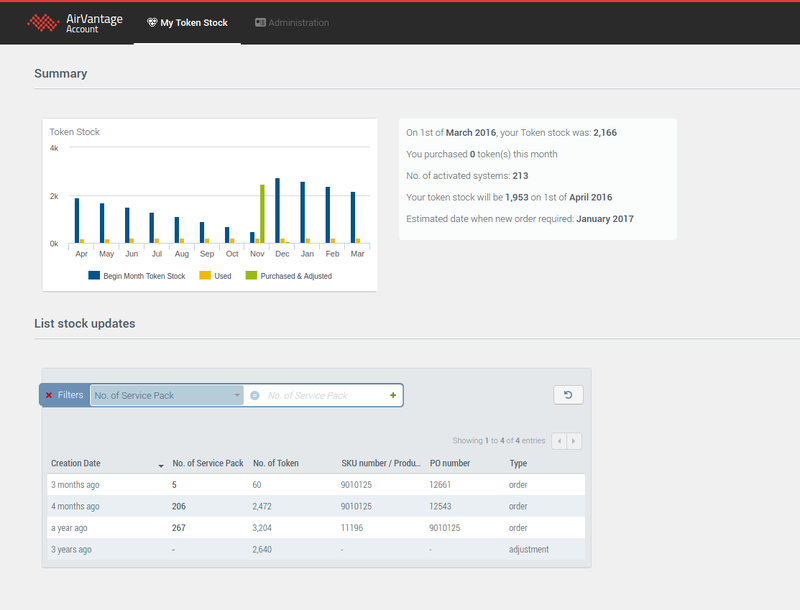 The Reports section shows the monthly token reports that have been sent to your company Admin contact(s). Links to reports for the last 12 months are shown. Each new month, the previous month’s report is added to the list and is accessible online. This is the tab where you can see and update your company account details and information. At the moment it consists of company name, uid and company branding. You can update this information if needed. This is simply an account statement, providing the updated token stock, and an estimated date by which you will need to buy more Service Packs. If your stock is likely to be adequate for more than the next three months, this is the only notification sent (future usage is predicted based on the last month’s peak). A link in mail also lets you download a detailed usage report for the previous month, in Excel format. The “peak” number of devices for the month, as used for billing, is listed in the “Activated systems” column. Token reports are also available in the Reports section of the Account Management tool, as detailed above. A special outage notification will also be sent if you are likely to run out of tokens in the next 3 months. This reminder will be repeated on a monthly basis until you purchase additional tokens or your account gets suspended. (And as these notifications are based on previous usage, if you are planning additional deployments you should check the token stock carefully to ensure you have adequate prepaid coverage). Your ALMS account will be automatically suspended after token stock calculation, if it becomes negative. We remind you that if your token stock drops below zero, your account will be suspended. 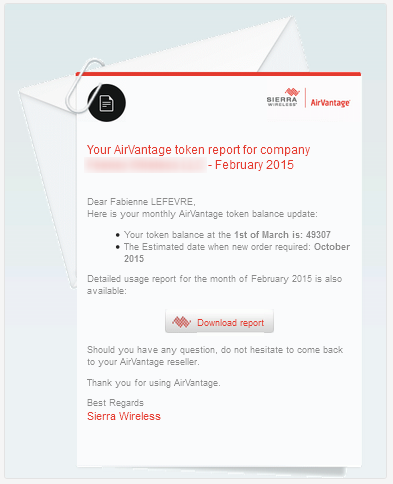 Users of a suspended company will not be able to access AirVantage at all until the account is reactivated. AirVantage will not store any communications data from devices owned by a suspended company. In greater detail, this means: that users will not be able to check any device data, or analytic data; that no jobs (such as firmware upgrades) will be retrieved by devices; that ALEOS configuration templates and batch configurations cannot be applied; and that no alerts or status updates will be sent. The suspended company account itself is not deleted however, meaning that it can be reactivated (for instance, by buying more ALMS Service Packs from your usual reseller). At that point, the company inventory and communications history will be in same state as they were when suspended, i.e. missing all device communications sent during the suspension.